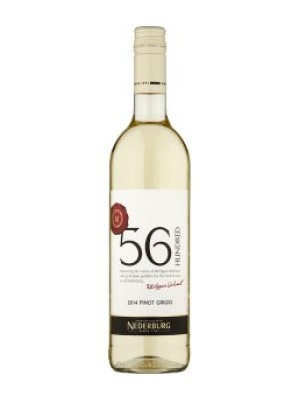 Nederburg 56 Hundred Pinot Grigio is a popular South African White Wine available from Tesco Wine in 75cl to buy online. Visit Tesco Wine for the best price for 75cl of Nederburg 56 Hundred Pinot Grigio or compare prices on our other South African White Wine products. Light, lively and refreshing with characters of juicy white peach and some floral notes This wine is ideal for drinking now but can be kept for up to 1 year. When every vintage is worth the wait - smooth drinking every time. Light, lively and refreshing, with characters of juicy white peach and some floral notes. Very food friendly. Serve chilled with light Italian-style dishes, also with Asian food made with just a little spice. Where to buy Nederburg 56 Hundred Pinot Grigio ? Nederburg 56 Hundred Pinot Grigio Supermarkets & Stockists. You can buy Nederburg 56 Hundred Pinot Grigio online in most retailers and find it in the South African White Wine aisle in supermarkets but we found the best deals online for Nederburg 56 Hundred Pinot Grigio in Tesco Wine, Tesco Groceries, and others. Compare the current price of Nederburg 56 Hundred Pinot Grigio in 75cl size in the table of offers below. Simply click on the button to order Nederburg 56 Hundred Pinot Grigio online now.